Trekking Sri Lanka which is known as the "pearl of the Indian Ocean" is 65610 KM Sq in extent since the country has a history of over 2600 years, the UNESCO has declared Anuradhapura, Polonnaruwa ancient cities, Sigiriya lion rock, Dambulla Cave's temple, Temple of tooth relic in Kandy, Singharaja rain forest, Knuckles mountain range, and fort of galle as world heritage monuments Constructed by ancient king, natural beauty, culture etc have created ample opportunities for adventure by foreign tourist. Why should you options for Eco tourism in sri Lanka? He is a person who has Conducted special research for about 20 years on sri Lankan fauna and flora of National Sanctuaries, Various kind of birds, animal, rivers, waterfalls and this institute is a result of his studies at present he is functioning as a Biologist and Ayurvedic Physician. also the Consultant of sri Lanka trekking. He is widely experienced in Eco tourism, Eco trekking, Eco camping, White water rafting, Hill climbing, Rock climbing, Canoeing, Bird watching, Cycling, and Night walking for Over 20 years, and has the unique capability of naming the birds by hearing their voices/sounds and to classify them. 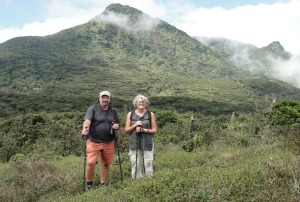 whilst arranging trekking adventures around the island his specialty is the "Knuckles mountain Range" in which the only pigmy forest is situated. He is a young Specialist in all the above fields. Those who are served by him will never forget his company and his experienced guiding, advising and lecturing. Especially Organize Three temple loop walking trek in the west of Kandy county side. Most ancient temple in the central highlands. ( 14th Century Hindu and Buddhist mix culture ) There are easy walking around 8km smooth trekking path which loop connect Gadaladeniya, Lankathilake temple, and Embekke Devalaya. leads past Reptilian, Lizards, Rabbits, Mongoose, several kind of birds, Through dense forest and alongside Greenish terraced paddy fields, and colorful kandyan herbal and spices home garden. Trekking, Hiking, Hill Walking, Bush Walking in Kandy & Knuckles Mountain Range. Peak of mountain range which have a geographical look like that of a man's first has been named by the Britishers as "knuckles range" As the tips of mountains of this range are always covered with mist the area around has been locally named as Dumbara ( full of mist ) this mountain range is located between Northern latitude 7 - 17' 7 - 40' and Eastern longitudes 80 - 43' - 80 - 55'. The entire Valley and the mountain area is 21,000 hectares ( 155 Sq KM) in extent and consists of 9 main mountain range and 35 supporting mountains with 160 varieties of flora and 10 varieties of fauna with 17 varieties of birds. The knuckles mountain range has to its credit 21 most beautiful waterfalls out of 382 waterfalls in sri Lanka. According to global and biological diversity Knuckles is a very significant place. "Eco trekking" is a popular company approved by the tourist board of sri Lanka. which arranges walking tours through the jungle absorbing the beauty of the jungle flower, birds and animals which are not available anywhere else in the world. As such we cordially invite all nature loving tourist of the world to experience the value of their gift of seeing . Knuckles mountain range named as a world Heritage due to this unique beauty and location. Knuckles mountain range has lot of forest trail and beaten treks, are the most suitable for walking trekking, in mount area. there trails cleared though the British period. # Adam's peak # Located in a picturesque surrounding of the southern hill country, this majestic peak has aroused the imagination of tourist for centuries and has been a focus of attraction of pilgrims of all religions for over 1000 years. The devotees of Buddha and other religions like Hinduism, Islam, and Christians climb the peak annually in single file to receive blessings . Buddhist believe the foot print at the peak belongs to the lord Buddha while Christians believe that it is Adam's foot print Hence the name given by Europeans was Adam's peak. it is the 4th highest mountain in sri Lanka which is (2244 meters) high. The entire area is rich in bio- diversity and is surrounded by the peak wilderness sanctuary. # Horton Plains National Park # is a mist covered eternally beautiful strange world with some excellent hikes in the shadows of sri Lanka. surrounded by the second and third highest mountain peaks in sri Lanka named Kirigalpotta ( 2395 meters ) and Totupolakanda (2359 meters ) the plain is interspersed with patches of think forest , rocky outcrops, filigree waterfalls with cloudy lakes. The surprising diversity of the landscape is matched by the wide varieties of wild life including rare Samburs. The highest mountain of sri Lanka Pidurutalagala ( 2524 meters ) situated in Nuwara-Eliya has been named by Englishmen as Pedro. # Singharaja rain forest # Reserve situated off Ratnapura is one of the least disturbed and biologically unique lowland rain forest and a National park in sri Lanka. 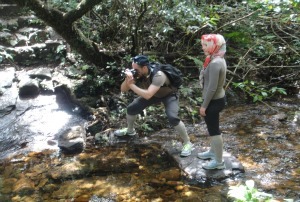 Virgin and Radiant waters and to see 50% endemic species, butterflies, and migrating birds. as well many kind of insects, it is of international significance and has designated a Biosphere Reserve was declared a world heritage site 1988 by the UNESCO. Knuckles Mountain Range, Trekking Camping in Kandy & National Park, Adventure Camping in Sri Lanka. If you are Over 5 years, you are qualified to undertake walking tours in sri Lanka. we are glad to inform you that " Eco trekking" is the Only major Company which organizes walking tours especially to remote villages of the country and undeveloped areas which have no human habitation. These tours can be categorized as Smooth trekking, medium trekking, and Adventure ( hard ) trekking etc, According to the taste and request of the Customers. We are especially experienced in erecting temporary Camp site in National Sanctuaries like Our based location Knuckles as pigmy forest, Rain forest of sinharaja, Horton plains, Yala, Minneriya, wilpattuwa, Udawalawe, Minneriya, National parks and Bundala and kumana bird sanctuary. We have selected safe areas to tour during the day time in order to see indigenous and exotic birds, various animal like stags, Sambhurs, wild boar, pole cat, civet cat, Crocodiles, Leopards, Sloth bear, etc and very safe Camp site to spend the night. most of them are quite Safe natural rock Cave's which are suitable for use even in heavy rains and which have been used thousands of years ago by our ancestors. As Nitre Cave's, Ash Cave's, Corbet's Cave's, Lakegala Cave's, Manigala beaten Cave's, and Hanthana rock Cave's etc. We take full responsibility for your safety. Our company has a well experienced team of cooks who are well versed in cooking delicious indigenous food varieties to suit your taste during Camping in this places. Eco Trekking Camping than Sri Lanka for your Ultimate choice. you could choose from a wide variety of experiences nature retreat to wildlife as night walk looking for lories, platform boat Canoeing, white water rafting, to safari at national parks, nature trail, mountain climbing, unexplored or undeveloped remote areas. These are the real wonders of Sri Lanka. (May you have a long life) IT is high time for the grand event. this season is almost good in every aspects in the weather, politics, and other cultural aspects. Sri lanka is self sufficient due to the rivers, lakes,reservoir( man made )and water falls and thick jungles situated in this land..